My baby started preschool last week. It’s part-time, three days a week, but still, it’s school. We waited with his sister at the bus stop and then jumped into the car and drove to his school. We ended up behind Sister’s bus for about half of the way, and he waved frantically out the window at her when they turned off the road. The school was busy when we arrived, with parents and young children up and down the hallway. He was so excited to go into his class that I didn’t even get to take a picture of him by the classroom door. I hugged him and said cheerfully, “Have a great day! Momma will be back in a little bit to come get you.” He barely gave me a second glace…the allure of the magnetic blocks was too great. Getting back into the car, I could barely contain my excitement. For the first time in almost 8 years, I had a morning all to myself. No whining voices. No sibling squabbles to break up. Quiet. It was like heaven. My only goal was to go to the grocery store and not have to yell, “Stop touching that! Come back over here! Stop running in the store!” 5,642 times. It was a little embarrassing, really. Driving down the road, Pumpkin Spice Latte in hand, sun roof open, with this playing on my iPod. I wanted to relish every minute of my break. Because my husband was once in the military, we have lived in several towns over the years, none of which are very close to family. As a result, I’ve pretty much had to learn the ropes of motherhood on my own. When my husband left the Marine Corps, we settled in near one of our old duty stations (again, not near family) so that my husband could work as a civilian in his field. Although we had email and the phone (and now Skype!) with which to connect with our families, it wasn’t the same as having my mother, aunts or cousins with me in person to show me how to be a mother. I’ve also been with my kids 24/7 since they were born. Yes, we have had a few babysitters every 6 months or so for a random date night, and my husband’s mother and sister traveled here to help when our son was born, but practically speaking, I’ve been with my babies each and every day of their lives. No weekends away, no overnights with grandma. It is a gift that I treasure greatly, however, all moms need a break now and then. Sally Clarkson says in her book Desperate that mothers need time every now and then to recharge and to build up inside themselves the love and patience that they pour out onto their families. After so many years of giving to my children, I was looking forward to preschool for a few hours a week to myself, in order to recharge a bit. One thing about motherhood that I wish someone had told me about early on is that it is constantly changing. I remember when I first had my daughter, I was functioning on practically zero sleep, trying desperately to get her to nurse regularly, haphazardly cleaning bits of the house whenever I could grab a few free minutes. I thought my life would be like that forever! A few months later, things had settled down into a nice pattern….she was taking three naps a day, eating regularly and going to bed early. Then she started dropping naps, and I had to learn the schedule all over again. Add a tiny little boy into the mix, and things got very interesting! Now those babies are in school and growing up all too fast. While I love to see how they are growing and figuring things out and developing such wonderful personalities, a part of me wishes they were tiny bundles in my arms again. Two hours later, I drove back to the school, all my errands accomplished. Not only had I checked off everything on my to-do list, but I felt refreshed and upbeat (it’s amazing how much you can get done without the kids!). I was eager to see my boy and find out how much he had enjoyed his first day at school. I waited outside the classroom door for the teacher to let the kids out one by one. Two names were called, then mine. He ran out the door yelling, “Mommy!” with a big smile on his face. I had to swallow back tears as I gave him a hug. “How was your day?” “Good!” he gushed. Suddenly that break didn’t seem so wonderful after all. I just wanted to be with this sweet boy with the big grin. Who cares if he runs around the grocery store anyway? Oh, I totally get this! I have been with my kids nearly every second of every day their whole lives too. I even homeschool them! When I get the rare girls night out or a date night, I feel this huge “WOOHOO” feeling, but as soon as I am on my way to see them or when I pick them up, my heart remembers that I really, really like them and being with them. Even if it does mean fights and whining! Growing up is so bitter sweet. My DD entered grade 6 this year. Its so hard to believe she isnt the little girl wearing gowns every day just because she could and is rather half way through her school. She will be going to the highschool next year and oh how it tears at my heart. The prospect of her dating, developing and of course me having to scare a bunch of dirty boys (LOL) My DS will be in grade 5 next year and I wonder when he will quit wanting to cuddle me and watch tv from my bed, when will he go from a baby who wants tucked in every night to a little man who can do it himself? Times seem to change more quickly than I like and like you I wish they were young again. Oh dear, I am SO not ready for my daughter to date boys…I’m glad it’s still a long way off 🙂 Thanks so much for stopping by today Marisa! It sounds like he had a great first day! You are so right. There are so many different stages of motherhood! Then each child is different, and you start from scratch! lol My husband enlisted in the military AFTER we were married and had our first two children so I went from being used to having family to help when needed to not being near them! He is going to be medically retired in 3 weeks, though, so we’ll be moving back near family again! That must have been hard on you 🙁 I’m glad to hear that you’ll be back near your family again soon….it makes such a big difference! It was neat to read your post as a man. My wife and I have six children, so I can relate in many ways. I will be passing your blog onto my wife, I am sure she will enjoy it! Motherhood is definitely an adventure. Things are always changing and you have to adjust. Since we homeschool I am often asked don’t you just want to get away and have some time away from the kids. I have to honestly say no. I really like being with my kids. I have a few friends that feel the same way, but the majority of them like/need a break. So I can understand when mom’s need time away from the kids. Oh Shelly, when I was writing this, I thought all about you and Sandra and I felt guilty for feeling happy to have some alone time. I’m glad to hear that you can understand moms needing a break 🙂 And I’m glad to have you for a friend! My husband is in the military. This is probably his last assignment. It’s hard for friends and even some family members to understand just how hard it is not to live around family. I get really jealous when I hear of family members sending their children to grandma & grandpa’s house for the night. I keep thinking when my husband gets out, we can move close to family. But, then I start thinking about job opportunities. So, we may end up like you guys…far from home. I think this really makes preschool important to us, as we don’t have that kind of support of dropping off the kiddos with a play date at grandma’s house for a couple of hours! I know that feeling of driving away from preschool and feeling absolutely giddy with freedom to do what I want to do…alone! Yes, it is so true that once you think you figured it out, something changes (and if it is only the after school sport once a week) and you start ALL over again. I am longing the day all my kids will be in school for a couple of hours for the SAME time, but I KNOW the feeling when all you see is the happy face of one of your kids and you think” Oh screw it, I will homeschool.” (Oh no I never will) just because you love them so so much. Change is hard, even if we longed for it for so long! It’s so funny, isn’t it…one minute you want a few moments of freedom, the next minute you want to be with them forever! 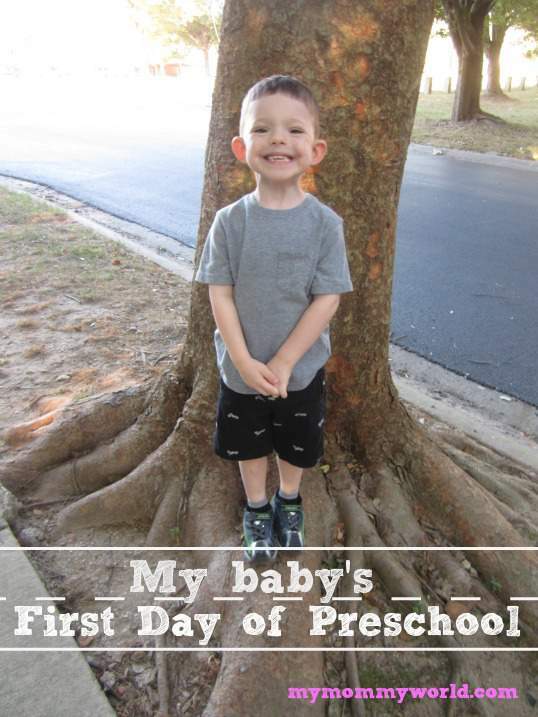 Thank you for sharing your son’s first day of Pre-school! How exciting it was for both of you! I have 3 kids, 10, 8, and 4 1/2 and we just started our first year of homeschooling… I miss that fist day of school feeling but I am loving the freedom it has given us. Enjoy your kids while they are young… take time for little things but it is also very important to take time for yourself to regroup and be a better mom! So important! Thanks for your wonderful article! I tried to leave a comment last night from my phone, but I don’t think it went through! I can relate to not being near family either as my husband is also in the military, though he will be medically retiring in a few weeks. We actually WILL be moving near family again, which will be nice! It really can be hard not to get a break! Motherhood is definitely full of changes! That’s so great that he had a good first day, but I’m sure it is a bit of an adjustment! I hope that your husband isn’t hurt too badly! My cousin had to medically retire last year and he wasn’t happy about it (he wanted to stay in the military). Good luck to you and your family! Your article definitely sounds like me! I sent my baby, who is still a baby, off to playgroup last week, without me! They offered that I could join the parent group that met while the kids played in another room, but I declined looking forward to some “me” time. LO toddled off to the toys while I left, only looking anxiously back at me once. The only difference being I sat in the car and cried for about 10 minutes, before going to the mall. I think it’s good for both of us. Like you, I don’t have a lot of babysitting, so a little time separate is good for me and good for him to prepare for school. I do miss him, and he has been more cuddly, but we’ll both manage. Thank you so much Chinky! That 18 month stage was very fun…hope you enjoy it! While we do live near to family, we also have a very close network of friends that take our kids, and we take theirs, on a pretty regular basis, but since many of my family has been in the military, I know how hard it is to make those long term friendships!! School is exciting, congrats on a great first day, very adorable kids!! Oh you sound so much like I did when my boys when to school too. I was part of your moving too but ours was 20 years. Family would have been nice. I am glad you had that time to yourself and glad you want to spend time with that little guy. It will all balance out. I am one of those mothers who has honestly not had much of a problem letting my child go. I know that sounds bad. I absolutely love her, but I am a single, working mom, and I appreciate the times that she is gone. The first time I really missed her was this summer. She was gone for ten days straight. Well, I saw for a few hours, but it was ten nights. I actually found myself looking forward to seeing her. She has become a very independent girl, and I don’t think she ever misses me. Her best friend mother, on the other hand, struggled when her daughter was at a slumber party at my house this summer. She actually wanted to go pick her up! Yes, I agree that motherhood is always changing. Cute post. Change is the only constant in parenthood, that’s for sure. Thanks for sharing! Seems like you are doing a great job with your kids! They look so happy and excited about school. Can’t wait until my little one is ready! But I don’t know how I will ever prepare myself for that, even though now I wish I had hours…days to myself!! I can relate to never having enough time to do things in the day, and just wishing for a couple of hours to myself…and I just have 1 baby! Don’t know how I will do it when baby 2 comes along! Hi Ana! It definitely takes some getting used to when you add the second baby, but you’ll work things out just fine 🙂 Good luck! I loved your post! It made me want kids even more that I already want them. I can feel that empty spot in my heart waiting for a loving adorable child of my own. I know that exact feeling! I am able to stay home this year, the last two years I worked at my daughter’s preschool so when I dropped her off, I wasn’t very far (like next door). This was the first year that I dropped her off and left the school to go get things done. It is amazing, goes by FAST but I LOVE that ‘MOMMY! !” you get when you walk in the door. Amazing. How nice that you were able to be at the preschool those first years! It’s so sad to see the very young kids crying for their mothers. i got preggers at nineteen, never liked kids. completely understand how you feel about learning the ropes on your own. my mother was terminal iwith lung cancer and died when my eldest was 3 months, when it rains is pours i guess. it is so hard i feel for ya! I’m so sorry to hear about your mom Eschelle! That must have been a terrible time for you 🙁 I wish you all the best in the future! I am not a mother, but I can still identify with the feeling of missing your baby. I have a dog who I spend 90% of the day with (I work from home) and when I spend a weekend away I miss my baby. 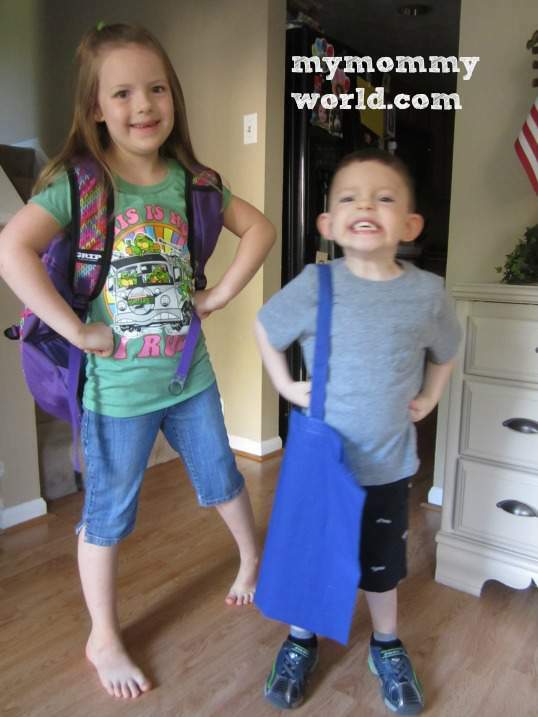 I cannot imagine what it is like when your kids start school! We have a “fur baby” too! He was so spoiled until the kids came, but now that they are older, he loves playing with them. Thanks so much for stopping by! I remember the first day of school for both of mine. They were so cute! They’ve changed a lot since then. My little guy just started his last year of preschool and my daughter is in first grade. It’s hard to believe how quickly the time passes! I am away from my son all day. I can’t wait to get home to him at night. I relish the times I can do errands on my own, but really life is just more fun with him. Good luck in this new phase of life. Great post! My wife was a stay at home mom too when our children were little and she describes it just about exactly as you do here. We too thought that the sleep deprived, messy house stage would last forever. Alas, it does not and we find that they are growing way too quickly. We are thrilled to be beyond diapers, but now we are hoping that things slow down a bit! I can imagine how exciting it was to have him excited to see you. I think that motherhood is a great blessing and something that some people take for granted. I haven’t had a huge change in schedule yet (he’s only 3 months) but that is good to know so I’m not totally shocked when it happens. Thanks again for sharing! Oh this brings back so many memories! Motherhood is so challenging because you are the answer to your children’s needs all hours of the day and night. My baby just left for his 2nd year of college and it still is hard to see him walk out the door. He is managing his own life now and I love that he can but I wish I could go back in time and hold my little boy! Children are only little for such a short time, I hope you continue to appreciate and love it! Your blog is so fun and interesting to read! Thanks! I remember when my oldest started kindergarten. I cried all night the night before. But in the morning, he went right out and got on the school bus all by himself. I felt so foolish. Aww, what a sweet story 🙂 I did cry when my oldest went on the bus for the first time to kindergarten too! I was so embarrassed crying in front of all the other moms, who were “pros” at sending their kids off to school. I can relate to you in so many ways. My son was born prematurely (at 24 weeks) so when I (FINALLY) brought him home (3 1/2 Months later), I had to learn the whole parenting ropes by myself as well. He was so premature that he basically was home bound his entire first year of life. His immune system was so low that he would get sick if someone had a small sniffle. So that kept the well wishers and visitors at bay, my husband, my mom and grandma were working all the time, and I was terrified at first. I got the hang of things– but then I ALSO threw a daughter into the mix when Aidan was a month shy of being 2. THAT mixed things up a LOT. SO, I had to manage not only being the sole parent but also managing 2 kids. I was around them all the time as well. My daughter started preschool this year! SO, I am in the same boat. I felt so lost, so weird, so lonely without her constant chatter and smiling face. As she climbed onto the morning bus to school– my eyes filled with tears and yet hers were dry and she was smiling. She was excited to make friends, and loves being a big girl. As the bus pulled away, I broke down.. :/ I finally got used to her not being here during the day and manage to get everything done and NOW do appreciate the mommy alone time! Everyday, I learn something new as a mother. And yes, I totally agree with needing to find that time and space for yourself. So that we may have something leftover to pour into our families. No matter the challenge, motherhood is so rewarding. Thanks so much for visiting Lynnette! Mine are just 2 and 4 months. It’s amazing to me how quickly I can go from “I need a break from you!” to “I miss you and am so happy to see you again” with both my boys. My 2 year old spent the day with some friends last week while I had work to do, and I’m pretty sure he didn’t notice when I left or came back – way too much fun and toys at his friend’s house! Those are definitely bittersweet moments. And your post is a good reminder for me to cherish these days – even when I want to pull my hair out! Lol, thanks Lindsey! I first heard that song in my Body Pump class, and I had to download a copy of my own. It’s such a feel-good song! Oh I miss my boys being young – when everything was so fresh and new. Now, they have moments of joy and I have times when I need that black and white shirt and a whistle to stop them from going at each other. Motherhood is a neverending rollercoaster of twist and turns but I would not trade it for anything else in the world. You bought back to memory those quiet times when they were at school and my anticipation for them to get home to tell me everything they learned and all the new friends they made. I feel like I need to go get one of those shirts and a whistle too! Just in the past few months, they have been fighting more and more. Guess it just comes with the territory 🙂 Thanks for stopping by Ms. Nix! Awww, how sweet! Your kids are beautiful! I’m not a mom, but I believe that moms do deserve a break every now and then, enjoy it!! As much as I am looking forward to preschool, I am also dreading it. I want the time to myself and at the same time, I don’t want my baby boy growing up so fast!